TORONTO, January 4, 2013 — Greater Toronto Area REALTORS® reported 3,690 sales through the TorontoMLS system in December 2012 – down from 4,585 sales in December 2011. Total sales for 2012 amounted to 85,731 – down from 89,096 transactions in 2011. “The number of transactions in 2012 was quite strong from a historic perspective. We saw strong year-over-year growth in sales in the first half of the year, but this growth was more than offset by sales declines in the second half. Stricter mortgage lending guidelines resulted in some households postponing their purchase of a home. In the City of Toronto, the dip in sales was compounded by the additional Land Transfer Tax, which buyers must pay upfront,” said Toronto Real Estate Board (TREB) President Ann Hannah. 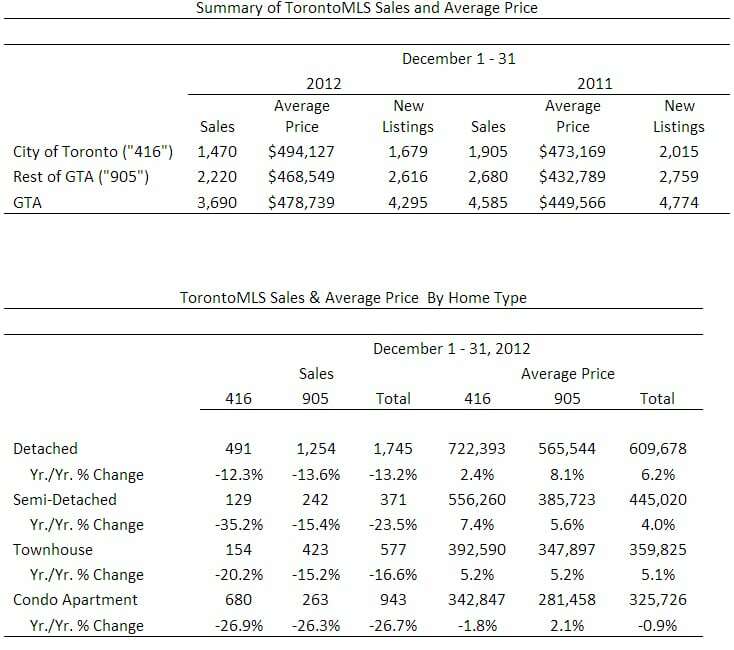 The average selling price in December 2012 was up by 6.5 per cent year-over-year to $478,739. The average selling price for 2012 as a whole was up by almost seven per cent to $497,298. “Robust annual rates of price growth were reported through most months of 2012. Price growth was strongest for low-rise homes, including singles, semis and townhouses. Despite a dip in sales, market conditions remained tight for these home types with substantial competition between buyers,” said TREB’s Senior Manager of Market Analysis Jason Mercer.